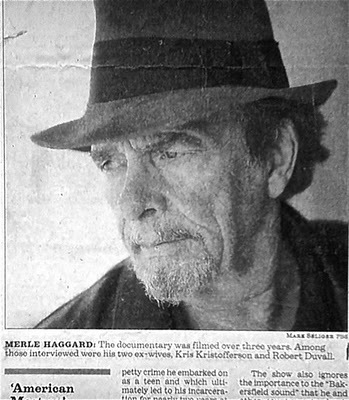 Did Merle Haggard marry Kris Kristoferson and Robert Duvall? Of course not! Don’t be stupid! Look very carefully at the last 9 words — “his two ex-wives, Kris Kristofferson and Robert Duvall.” The sentence, as it’s written, looks like Rural Merle was married to Kristofferson and Duvall. That’s because the newspaper forgot to put the Oxford comma after “Kristofferson.” If they had, it would look like the documentary interviewed four people: two ex-wives, Kristofferson, and Duvall. But the Associated Press typically does not use this device, and as a result, most newspaper writers and editors have taken it to mean “There will be NO Oxford Commas EVER!” What they forget is that the Oxford comma may be used if it will clarify a confusing sentence. And the sentence about Merle Haggard’s marriage partners is about as confusing as it can get. I may have the occasional argument with an editor or punctuation stickler about the use of my beloved Oxford comma, but I have never seen an instance where using the Oxford comma caused confusion. On the other hand, there are occasions where blindly adhering to the “no Oxford comma” rule can cause all kinds of confusion. Or at least raise some interesting questions. Randy, I may be a newspaperman, but I loved my Oxford comma way before that. Plus, my background is in social science, and we use the American Psychological Association (AP) style guide over AP. I wrote like AP, punctuated like APA. Thanks for the clarification. “The Oxford comma may be used to clarify a confusing sentence.” I wondered why a newspaperman, such as you, would support the oxford comma. I assumed all newsprint people followed the AP standard. Silly me.